It has been very busy here at camp over the last couple of weeks and being behind on the blog is just the tip of the iceberg. So with that in mind, and with the new plan of trying to stay on top of posting the blog on time, I, Colin McKeen, a Canadian, am going to take my first stab at writing a blog. I'll try to keep the "eh's" out of it but that also means there won't be any "y'all's" present either so just bare with me. As far as Saturday mornings go here at Wine Lake, I believe July 15, 2017 may go down in history. The last of the Barbera group pulled out of here Friday morning which left us ample time to get ALL the cabins cleaned on Friday and still have time for some Trout fishing...cough cough..I caught a 38-inch Laker..cough cough... But anyways, that means that the usual Saturday morning cabin turnover was nowhere in sight which allowed Brenden and I to go to the landing with Nick to give the grass a good haircut and the Eagles Nest a good makeover. Sunday July 16, 2017 will forever be a very special day for Chase Kincaid and Sam DelPrincipe as they got engaged out on "The Nursery"!!! And there's the biggest catch of the year! All of the Wine Lake staff and I'm sure many more are very happy for you two! Congratulations! The wind decided to book a visit with us this week and boy did it get its monies worth. I don't think there was a calm day on the water all week but that didn't keep anyone off the water or the fish from biting their lures. It wasn't just the wind that came for a visit this week. A couple of pelicans decided to be honorary seagulls one morning and designated the swimming rock as theirs. Jody was able to get snap some great pictures. As the summer progresses and the families here spend most of their time out on the water it allows us to start chipping away at that previously mentioned iceberg. We were able to cut some trees down to be used as firewood or for fixing boat ramps. Nick and Beezy were able to repair a float-away section of the dock, and Nick also re-leveled the back porch. The one thing that Nick refuses to work on however is this habit he has of wearing his socks and sandals at the same time.Unfortunately for us, he found some fellow members of the socks-with-sandals club and they only furthered his feelings that he should continue this trend. Thanks a lot guys!! Tournament day was a family battle as the 3 boats of Kincaid's and the 4 boats of the Lookingland's competed against each other and their own families. JoAnna and Mike Lookingland were the tournament champions not only because of their 18", 17.75" and 17.5" Walleyes but because they also caught two rare species. They reeled in a stringer and a net from the bottom of Wine!! Well don't you guys just have all the luck!! On a side note, the Lookingland children got into the tournament spirit with matching outfits and won the best dressed award!! "Looking" good guys. The Baer's were a big help to us that day as well and put their muscles to great use to help us churn the ice cream! Fishing is not the only way to enjoy your week long stay here. Bryan and Karen Heap are one couple that really enjoys the beauty of Wine Lake. And by that I mean that they prefer to look out at this beautiful lake from the deck of their cabin rather than from their boat! They take their relaxation vacation seriously and really soak up the sun rays and fresh air here on "the rock." When they would be heading out to fish at 5pm(for the first time that day) people would ask them, "how has the fishing been today?" Bryan happily responded, "well, we're about to find out!" But that paid off for them when they went out for a nice dinner and sunset watch one evening and got to see a Bull swimming in the lake and then a Cow doing the same thing about an hour later! There were a lot of broodstock Walleyes caught this week as well as some good trophy fish in each category and the staff here were very happy to see that everyone respected Wine's Catch and Release policy! The remote lakes got some great use as well as everyone enjoyed the Small Mouth fishing and caught some great ones. Just a heads up to all of you that are coming soon- rain has been at a premium and the falls as well as all the lakes are low so plan on portaging all the boats as we cannot run the falls and will have to take your time going in and out of all the lakes. I hope you all have enjoyed my first attempt at blog writing which I have come to realize is harder than I had expected but really fun nonetheless. Life truly is amazing here on this beautiful rock that is filled weekly with amazing people that have awesome stories about the unique history of this place and some of the great times they have had along the way. We're doing our best to make sure that everyone has a fantastic week while they're here because relaxing, enjoying the sights and catching a whole lot of fish is exactly what this place is all about, "eh?" Unfortunately, my daughter had to return home to begin getting ready for her second year in college and that leaves me to begin doing the Blogs from here on out. I cannot promise I am able to write as well as she does, but I will make sure you see and hear what happens at Wine Lake. The number one question I get is: “how high is the water?”. I am here to tell you this year it is about 14 inches below last year this time. We have not been able to run the falls and do not see that happening any time soon. We just have not had the rain to raise the water level. Since I have arrived on May 2nd, the water has only gone up 2-3 inches, that is it. With no real substantial rain in the forecast I do not see that changing. The week of July 1st was a great group. We had Pat Moss and his group who were very adventurous. Pat and his son decided to go up to Little Trout. Their journey took them through the bush, a swim across an unknown lake to look for our boat which was on another lake and ended with them being waist deep in the muskeg. But even through all of that they managed to find the right lake and spend some time recovering on Little Trout before heading back. We had several father son groups as Chris Foat brought his father and Jake brought his father. They all seemed to enjoy the time together as they logged many hours on the water. We had not one but two birthdays in camp this week. Pat McLaughlin and Katie Elwood both celebrated their birthday in style wearing cute tiaras. Katie Elwood jigged up a 35 ½ in Lake Trout in 70 feet of water as well as 2 really nice Burbots. Katie and her Mom also came away with the tournament win on Wednesday. Her brothers seemed to have a good time even with a tough bite that week due to Mayflies, no wind, and high sun. John Hartman, a second-generation Wine Lake regular brought his wife, daughter and grandson to represent 2nd, 3rd and 4th generations to Our family. It always amazes me how deep the lake runs in many families and how they care for this place and the fishery like they do. It is what sets Wine Lake apart from many other places in this vast beautiful country. I have said it before and will say it again, it is all of you who make Wine Lake what it is. We have by far the best people coming here that I have ever encountered. The week of July 8th was an interesting one. It started off when I woke up on Saturday morning to get everyone loaded up and went down to the dock. The first thing I notice was that the plate boat, that was fine Friday afternoon, was about 2 inches from being completely filled with water. If a wave of any size been present, the boat would have been sitting on the bottom of the lake. Luckily for me it was early and a calm day so we were able to put 6 bilges in the boat and have it ready to leave at 6 am to head back to the landing. Later in the day I inspected the boat and found some water again had gotten in. I took out the plug and replaced it with a new one and we kept an eye on it all day. It never got another drop of water in it. How the plug started leaking one day on its own I will never know. Life on a lake! In came the Barbera group. I had talked to the leader of their group many times last year and they were interested in renting the entire camp out for a week. I happened to have a week with no bookings yet so we went ahead and set it up. Wow what a week. 24 guys and sons (mostly older boys) in camp with no females to keep them in check (except poor Jody who works with us). They made great use of the basketball net, the Moose cabin (which is where they all would get together to play cards and to have their communal meals) and of course the recycling bins… never short on empties. Nick, the feisty one of the group, decided he needed to wrestle so he began with one of the boys. Lewis (Nick’s Uncle) seeing his son struggling with Nick did what any good father would and stepped in to back his son up. Though it appeared fairly even matched Nick had the stamina and they called it a draw. Finally, Nick had to face Mitch for his third match. Both made a strong showing. Nick proved he had what it took as he withstood all three and never got pushed around. One evening Max (a son) treated us to some guitar playing. Not just any guitar playing but guitar with musical and vocal accompaniment via a machine he brought with him. He would begin by laying down the vocal back-ups he needed in the song he was going to sing, as well as the musical back up he would play with or sing too as the song progressed. He was then able to hit foot controls as he played and sang which made the entire song sound as if it was recorded with other people playing guitar with him and back-up vocals. All of that taking place around a fire pit at Wine Lake! I cannot imagine the time and effort that has to go into learning just one song as well as learning how and when to bring the back grounds in at exactly the right times. It was impressive to say the least and we all enjoyed and evening listening to Max. It was so good, that you forgot you were miles away from anything in the bush being eaten by mosquitos. Mitch one day saw our water skis and decided he wanted to try to ski behind the boat with the 25hp motor. I told him it would never work and headed up to grab lunch. About 30 minutes later I heard all of the guys cheer and looked out the window to see Mitch up and skiing behind the 25hp camp boat. Then he took it even further and dropped one of his skis and did a loop on just one. It was very impressive. The group decided to move the tournament and ice cream up to Tuesday as a couple of the guys had to leave earlier in the week for work or family engagements. Unfortunately, it was the most rain we had received in one day all year, one-inch total! It rained almost non-stop from dawn to dark that day. Several teams made a good showing even in the wind and rain and made it through. Jim and Keith were the big winners that day and became the first tournament champions out of the Barbera group. 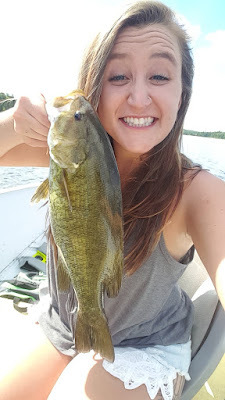 As this was the group’s first time at Wine Lake, I was hoping the fishing was going to be good and they would enjoy themselves and come to love Wine Lake Camp like so many of us have. In the end, I was getting quotes from the guys saying “This is an awesome camp”, “Best camp ever in 25 years of coming to Canada”, “Epic trip!”. Hearing those kinds of remarks really made myself and the crew feel great about the effort we put in here, and know we are working hard to make sure everyone has a great trip to Wine and want to come back in the future. Fishing the last week was really good for July. Groups are catching really nice Walleyes in the weeds with some Northerns mixed in. I am guessing they will begin moving out into a little deeper water over the next couple of weeks. We are expected to have a bunch of sunny and 78-82 degree days. This will continue to warm the water and push the fish deeper. I am guessing they will begin hanging in the 12-15 foot of water range and be schooled a little more than they have been. Perch fishing has still been pretty good. Some people are continuing to pull up some really nice fish in 7 feet of water in the weeds. Trout fishing has been ok if you can find them and get down to them. On Friday, the Barbera group all had to be heading home so I took the camp workers out for their first time Trout fishing. Colin caught a massive 38-inch trout and Brenden caught a 33-inch trout. We also managed to land an 11-inch trout which makes the future look bright. As we head into the middle of the summer the camp hustle has slowed down. People are not rushing down to the dock first thing in the morning and they are also staying out later in the evening. Shorts are finally part of everyday wardrobe which is a nice change of pace. The next few weeks look to be nice and pretty stable as far as our weather. Look forward to seeing you all.